During the summertime I love dining outside and am always looking for casual meals to take outdoors. So I love dishes where everything can be made in one big wok or pot and then taken right to the table. This Spicy Stir-Fried Crab Legs is that perfect summertime dish. Quick and easy to make, these crab legs are stir-fried with a spicy, savory sauce that is finger-licking good. Add some corn-on-the cob and a salad and you have a scrumptious no-fuss meal to enjoy during the summer months. 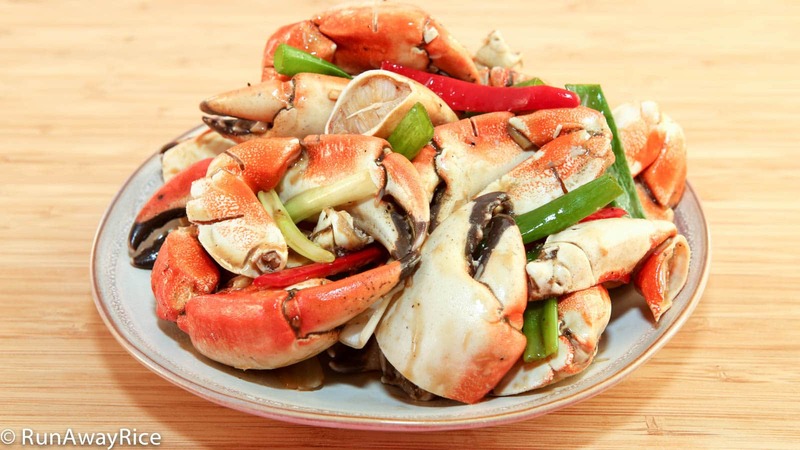 You can use both crab legs and claws in this recipe. If buying whole crab legs, cut them into 4 inch lengths. I bought the crab claws already cut and scored which is so convenient. (The brand is called Nautilus and they are sold frozen.) The scoring not only makes them easier to crack open but also allows the stir-fry sauce to permeate the meat during cooking. You can use fresh crab legs as well. Just cook them before stir-frying. Substitute the red chilies with red bell peppers or any mild peppers of your choice if you want to tone down the heat. Rinse crab legs with cool water several times to wash off any dirt or sand. Drain in a colander. Smash garlic, remove the skin and then chop. Peel off skin from ginger and then cut into thin strips. Cut red chilies in half, remove the core and then cut into thin strips. Cut the green onions into 2-inch sections. In a measuring cup add water, soy sauce, Vodka 5-Spice Marinade, oyster sauce, plum sauce, cornstarch, ground black pepper and stir until smooth. Heat a large wok or skillet over High heat. When hot, add vegetable oil. Add garlic and ginger and stir-fry for 15 seconds. Add the yellow onions, red chilies and stir-fry for 1 minute. Add the crab and toss in the wok, cooking for 2 minutes. Drizzle 1/3 of the sauce onto the crab legs coating them evenly. Toss together. Drizzle another 1/3 of the sauce and toss together. Add the remaining sauce and combine. Stir-fry for another 3-4 minutes tossing, coating the crab legs with the sauce. Turn off the heat, add the green onions and ground black pepper and combine together. 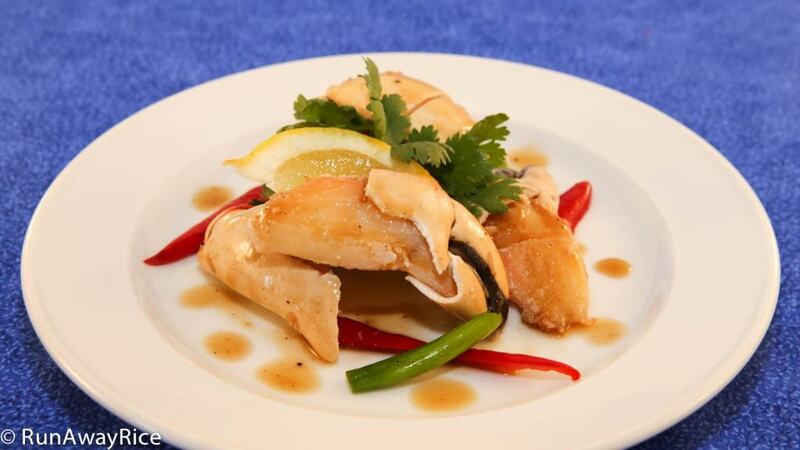 Enjoy these spicy, savory and succulent crab claws in no time at all with this easy recipe! Where did you get the Nautilus frozen crab? ARe they are American or asian store? I bought the Nautilus brand crab claws at 99 Ranch markets and have seen them at the Asian markets as well. I haven’t seen these at any of the American grocery stores. Hope that helps!